Ramsay Hunt syndrome is an acquired paralysis of the face (Bells Palsy) specifically caused by a varicella-zoster virus (VSV) infection of the facial nerve. The symptoms on the affected side typically include facial weakness, a painful herpes type skin eruption on the pinna of the ear, and there is frequently vestibulo-cochlear disturbance (i.e. there may be dizziness or a disturbance of hearing). About 5/100,000 persons per year develop Ramsay Hunt. It is the second most common cause of acute peripheral facial paralysis. In our clinical practice in Chicago, as of 2015, we had 12 cases of Ramsay Hunt in our database. This is far less than the number of cases we have of vestibular neuritis or sudden hearing loss. Total recovery of facial movement occurs in about 50% of treated patients. If hearing is affected (about 1/3), complete hearing recovery occurs in about half. Of course, like anything else, recovery is predicated on the amount of damage. A case of Ramsay Hunt is shown here. Diagnosis of Ramsay Hunt is usually not difficult. The combination of peripheral type facial weakness (Bell's palsy), with pain and blistering of the ear is generally sufficient. Especially severe Ramsay Hunt patients also develop dizziness and hearing loss. Most Ramsay Hunt patients have more damage to the facial nerve than hearing, but there are occasional exceptions (Kuhweide et al, 2002). Testing may be helpful to ascertain the extent of damage to the 8th nerve, in persons with dizziness or hearing loss. Those with damage may benefit from vestibular rehabilitation and there is also some prognostic significance. ENG testing assesses the integrity of the superior division of the vestibular nerve. This is often abnormal in patients with Ramsay Hunt and dizziness. 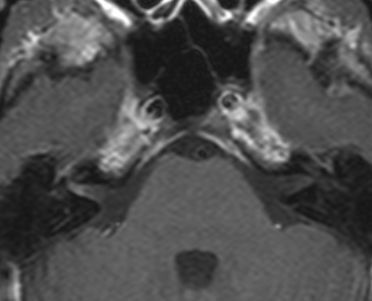 MRI shows enhancement of the 8th nerve in about 3/10 (Iwasaki et al, 2013; Kuo et al, 1995). The image above shows enhancement on the right nerve (which is left side of image). Because only 3/10 patients have enhancement, this is certainly not a sensitive test for Ramsay Hunt. Rotatory chair testing and VHIT testing are other methods of asessing function of the 8th nerve. Abnormal VEMP test in patient with Ramsay Hunt syndrome. The left side (on the right half) is much smaller than the potential from the right ear (on the left side). VEMP testing assesses the inferior division of the vestibular nerve. It may be abnormal or not. Persons with an absent VEMP would be unlikely to subsequently develop BPPV. As the 7th nerve is involved in Ramsay Hunt, it should reduce contributions to the VEMP from facial nerve innervated muscles on the side of lesion. For this reason, it is very important to check for the posterior auricular muscle response when doing VEMP's in this situation. 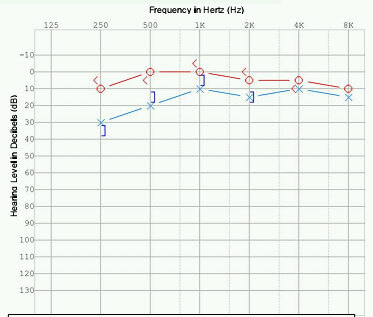 Abnormal audiogram in patient with Ramsay Hunt syndrome (same one as above). The left side shows a mild low-tone sensorineural hearing loss (similar to that seen in early Meniere's disease). 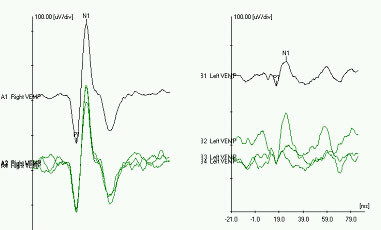 Audiometry assesses hearing. It is variably affected in Ramsay Hunt. The usual rule -- wait 4 months before deciding on ultimate prognosis, applies here. According to Wayman (1990), prognosis for hearing recovery is excellent. First one follows the usual procedures for a severe Bells palsy. Additionally, prednisone treatment and antiviral treatment, namely acylovir, are now recommended. Either 750 mg of intravenous acyclovir/day or 4000 mg of oral acyclovir taken every 4 hours is equally effective. If an oral antiviral is used, it is better to choose one that is better absorbed such as famvir or valacyclovir. In this case, doses are much lower and drug can be given every 8 hours instead of every 4 hours. Hearing recovery is best in patients treated within 3 days of onset with acyclovir/Prednisone. Most authors have found that only 5% of persons with Ramsay Hunt have residual hearing loss. Ramsay Hunt is due to Herpes Zoster, which is a recurrent chicken pox. Recently there has become a vaccine available for this purpose. It seems unlikely that it has utility in persons who have already had Herpes Zoster, as such people should already have high levels of immunity. Postherpetic neuralgia is common after zoster, and may be treated with anticonvulsants, pain medications, and neuralgia medications. Iwasaki, H., et al. (2013). "Vestibular and cochlear neuritis in patients with Ramsay Hunt syndrome: a Gd-enhanced MRI study." Acta Otolaryngol 133(4): 373-377. Kim, C. H., et al. (2015). "Vibration- and hyperventilation-induced nystagmus in patients with Ramsay Hunt syndrome with vertigo." Otolaryngology - Head & Neck Surgery 152(5): 912-918. Kuhweide, R., et al. (2002). "Ramsay Hunt syndrome: pathophysiology of cochleovestibular symptoms." J Laryngol Otol 116(10): 844-848. Kuo, M. J., et al. (1995). "Early diagnosis and treatment of Ramsay Hunt syndrome: the role of magnetic resonance imaging." J Laryngol Otol 109(8): 777-780. Wayman, D. M., et al. (1990). "Audiological manifestations of Ramsay Hunt syndrome." J Laryngol Otol 104(2): 104-108. Note that this website has two different pages on Ramsay Hunt, which will eventually be merged.